"I see what you think of me," said he gravely -- "I shall make but a poor figure in your journal to-morrow." "My journal!" "Yes, I know exactly what you will say: Friday, went to the Lower Rooms; wore my sprigged muslin robe with blue trimmings -- plain black shoes -- appeared to much advantage; but was strangely harassed by a queer, half-witted man, who would make me dance with him, and distressed me by his nonsense." "Indeed I shall say no such thing." "Shall I tell you what you ought to say?" "If you please. ""I danced with a very agreeable young man, introduced by Mr. King; had a great deal of conversation with him -- seems a most extraordinary genius -- hope I may know more of him. That, madam, is what I wish you to say." "But, perhaps, I keep no journal." "Perhaps you are not sitting in this room, and I am not sitting by you. These are points in which a doubt is equally possible. Not keep a journal! How are your absent cousins to understand the tenour of your life in Bath without one? How are the civilities and compliments of every day to be related as they ought to be, unless noted down every evening in a journal? How are your various dresses to be remembered, and the particular state of your complexion, and curl of your hair to be described in all their diversities, without having constant recourse to a journal? 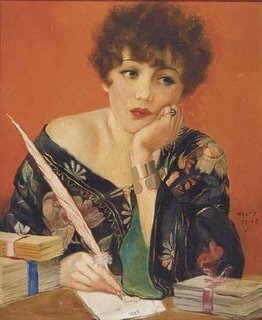 -- My dear madam, I am not so ignorant of young ladies' ways as you wish to believe me; it is this delightful habit of journalizing which largely contributes to form the easy style of writing for which ladies are so generally celebrated. Every body allows that the talent of writing agreeable letters is peculiarly female. Nature may have done something, but I am sure it must be essentially assisted by the practice of keeping a journal." —¿Quién dijo que los diarios íntimos eran secretos antes de que llegaran los blogs, y se quedaban en un cajón esperando a la posteridad?